After it has sent its first delegation to the United Nations 9th Youth Assembly and set a system of representation to the UN HQ, UNYA Lebanon is launching on August 26 2011 the Lebanese Youth Mobility Fund, a leading project to facilitate traveling of young Lebanese artists, activists and researchers around the Arab world in the purpose of circulating their knowledge. This fund will be managed by professionals on a volunteer basis. It is 100% self funded, and this is where your support is very much appreciated. 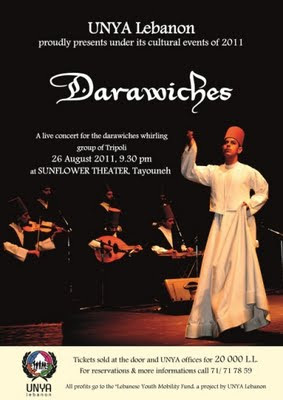 As a fundraising activity and within the enchanting spirit of Ramadan, UNYA Lebanon is organizing "Darawiches" a concert for the Derwiches whirling band of Tripoli, on Friday 26 August 2011, starting 9:30pm, Sunflower Theater -Tayouneh, Beirut. Tickets are for 20,000 L.L. And all profits go to the Lebanese Youth Mobility Fund. On the event Facebook Page. Tickets are sold by phone (71 717859), at UNYA Lebanon office or at the door of Sunflower Theater. تقدم جمعية شباب الامم المتحدة في لبنان، ضمن برامجها الثقافية لعام 2011 "دراويش"؛ حفلة حية لفرقة الدراويش الراقصة الطرابلسية في ال26 من شهر أغسطس، الساعة ال9:30 مساء، على خشبة مسرح دوار الشمس، الطيونة بيروت. تباع البطاقات عند الدخول أو في مكتب الجمعية بقيمة 20000 ل ل. كل الأرباح سوف تعود الى صندوق تجوال الشباب اللبناني. سجلوا دعمكم للنشاط الشبابي اللبناني، وسجلوا حضوركم!